Fillings are designed to be tough, but they must be replaced eventually. Our Mill Creek, WA, dentists, Dr. Chad Slocum and Dr. Sara Lundgaard, share a few signs that may indicate that it's time for a new filling. Wear and tear can eventually cause fillings to crack. Although it usually takes years of wear to crack a filling, the problem can occur sooner if you grind your teeth. Any opening in a tooth, even one as narrow as crack, can allow bacteria to enter the tooth and cause decay. In some cases, you may actually see a crack in a filling, but in others, you might not know you have one until you have X-rays during a dental visit. If you have a crack in your tooth, you may develop a cavity under the filling. It's important to schedule a visit with our Mill Creek office if you develop pain in a tooth that has been filled. Sensitivity to cold temperatures can occur as a result of leaky fillings. The problem happens when fillings don't adhere tightly to the sides of your teeth. 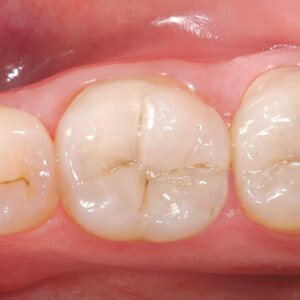 Tooth-colored composite resin fillings can eventually become darker or may look slightly yellow. Replacing the filling restores your tooth's appearance. There's no doubt that you need a new filling if you've lost all or part of your filling. If this happens, call us as soon as possible during regular office hours. You might experience a little pain when the tooth is exposed to the air or hot or cold temperatures. If this happens, applying a little dental cement, available in drug stores, can help reduce the sensitivity. Depending on the type of material used, fillings usually last between seven to 15 years. If your filling is old and showing some signs of wear, it's best to replace it before it cracks. Replacing problem fillings promptly can help you avoid tooth decay. If you're concerned about a filling, call our Mill Creek, WA, dentists, Dr. Slocum and Dr. Lundgaard, at (425) 337-7300 to schedule an appointment. It takes a lot of skill, experience, talent and artistry to create tooth restorations that look so natural that no one can tell them apart from the originals. To do so requires understanding of the normal anatomy of a tooth as well as of the interactions of light and color. The color that we perceive when looking at a tooth results from the combined appearance of the tooth’s center core (dentin layer) and its covering enamel. Going from the outside in, the enamel is made of tightly packed crystals of calcium, which cause it to be one of the hardest substances naturally produced by animals. The crystals are also responsible for a tooth’s brilliance and translucence. The dentin is more like bone, a porous living tissue composed of microscopic tubes, interspersed with more calcium crystals. In the very center of the tooth is a central chamber containing the pulp and nerves. Each of these layers has its own physical and optical properties. Since the enamel is translucent and the dentin is more opaque, most of the tooth’s color comes from the dentin and is transmitted through the enamel layer. Factors that affect this transmission include the thickness and age of the enamel as well as external tooth whitening. If the enamel is more translucent, more of the color of the dentin shows through. If it is more opaque, the enamel absorbs and reflects light so that less color is visible and the enamel looks brighter. Color means the whole spectrum in the rainbow. The spectrum is made up of the three primary colors — red, blue, and green. When all are combined, they create white light. Hue refers to the brightest forms of the colors. The color we perceive depends on the dominant wavelength of light that is reflected by an object. Value refers to a color’s lightness or darkness. A brighter color has a higher value. Chroma is the amount of identifiable hue in a color. An achromatic color (without hue) appears gray. Saturation is a measure of a color’s intensity. This terminology of color is used not only by dentists and dental technicians, but also by a wide range of artists. It implies expertise and understanding of how colors work, how they vary and change and affect one another.